Samir was ecstatic when he heard the news, he congratulated the couple. He was even more happy to hear their decision to wait until college was over and they were both comfortably in a job before the wedding took place. He knew they were young, only 18. But he knew it was pure magic that allowed two young souls to find each other so early on in life. He was only saddened that Hazel could not join in on the happiness that night. Goodness knows she needed it. The registered nurse of the ward knew of Hazel’s condition and knew dedication when she saw it. Most people do not come and visit all day long or even every day, but Samir did; from morning to night he was there. And so she pulled some strings and decided to let Samir stay there all the time. Whenever he wanted to go home, he could, visiting hours was no longer a restriction. He was overwhelmed with the kindness and spoke to Hazel in a low voice, stroking her long hair as he told her of the generosity given to them. Hazel no longer spoke. She just slept, or stared out the window. That didn’t discourage Samir though. He knew that the girl he loved was still in there, trapped under the weight of sadness for all that she had lost in life. He just needed to show her that he was there… that she was no longer alone. Behind Hazels blank looks none knew but she was living her life out before the accident. Every major happy moment of her life was being re-lived by her mind. When she graduated college, meeting Samir, having Colton, watching Colton grow up, opening her art galleries, being at Jenny and Dennis’s wedding, being at the birth of Garrett. It was all good memories she was remembering, nothing bad. During the months she had been in the hospital, that’s what her mind was doing, her state was induced by the happy memories. It seemed that her mind thought that since she was happy inside, why should she come out of that happy place and live in the sadness and sorrow that reality and the present held for her? And so every moment that they thought Hazel was unresponsive, she was just in her head, safe and sound. She was not insane; instead her mind had rejected what it did not want to accept and to save her sanity, placed her in times that she was happy. That Monday would mark exactly two months since Samir left Egypt to be by Hazel’s side. It was another typical evening. Hazel was asleep and he was singing softly near her bed one of the many songs he had taught her in Al Simhara. It was the song he taught her as they lounged on the grassy shores of the Nile eating dinner and drinking wine, dancing and laughing. He was lost in his thoughts of those happier days that he did not hear the rapid tiny beeping of the heart monitor as it sped up. She forgot about that? Oh how could she forget about that night? That song that he taught her to sing, that she taught Colton! She watched as he thought over the right English words to describe the beauty of the song. It was as if that conversation, that particular memory had triggered all the bad ones to come. That was the day that she had met Samirs father and he had been so rude and cold to her. Seeing the face of the old bitter man, set another wave of memories to surface, the call, Samir being married, the loss of her mother, the abandonment. Her mind was desperate to cover it all, to bring back the sweet pleasant place that had kept her hidden all these months, but every time a good memory was brought up, something bad immediately replaced it. And then there was Jennys wedding, holding Garrett’s tiny form after he was born…and in came the images of the flight crash, the phone call to the airline…the knowledge that Jenny is dead ….JENNY IS DEAD! Samir snapped from the sleepiness that was overtaking him as he felt Hazel move next to him. She was sweating and cringing, her hands were clawing at the white sheet that covered her, she looked like she was having a nightmare, the monitor was showing that her heart rate had increased to an abnormal high. Samir rushed out of the room, screaming for the nurse. “Whats wrong?! Whats happening?! !” He screamed, scared and frantic. There were two nurses in the room, trying to stabilize Hazel as the Doctor entered the room, she was going into psychological shock. “Sir, we need you to wait outside please!” One of the RNs ushered him outside. 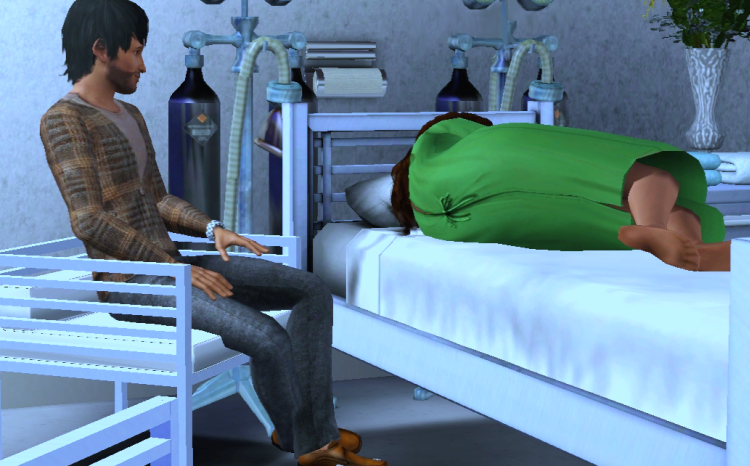 The nurse was grabbing boxes of things from the front desk and hurrying back to Hazels room, she looked at him, “You should wait to speak to the Doctor.” And before he can persist, she had disappeared into the room. Samir quickly took advantage of the moment to call Colton at home. I so wish she could wake up and be well. ❤ I wish it were so as well. Thanks Rika! That’s loosely based on an Indian…Hindu based legend. ^^ I didn’t remember the whole thing my dad told me but I decided to weave my own story amidst the basic storyline. I love Hindu tales, there are so many stories of gods and goddesses…they are beautiful! I actually loved doing the Egypt scene…it was nostalgic of when I first began the story…. i really enjoy the little myth about the god and the goddess. that was a fantastic touch to the chapter 🙂 great update…itching for more! Amazingly well-written! It was a delight to read. New chapter up on my blog. Hey, waiting for a new update, this chapter was great! 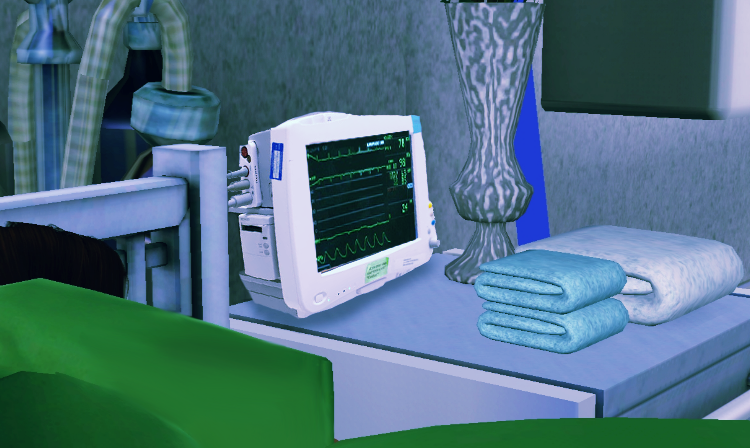 Also as a side note, if you’ll ever need to use hospital stuff for another story mod the sims has an excellent hospital download package for free. Cin: Aww, its alright! I know how busy feels. T.T Thank you so much though for taking the time to read and comment. <33 Much appreciation! Uh, oh… I’m almost afraid to read the next (and sadly, last it seems) chapter! I absolutely adored the story you told about the goddess and the cobra. And explaining her insanity in such a way made absolutely perfect sense. Then pulling her out if it in such a clever way… great job!